I love my kitchen gadgets and helps. I have a few favorites that I would like to tell you about. My top pick for the kitchen that is handy to have is an immersion blender. I have one from Braun that I won at a silent action in 2002 that still works, but Kitchen Aid has a great one, as well as Cuisineart. They range from 20-100 dollars. What I like about them is that you immerse the blender in your soup pot (or other dish) and are able to blend the soup or sauce in the dish, rather than placing it in a blender and having a big bulky thing to wash. The blending stick is detachable from the motor and is usually dishwasher safe. Win! Salt and pepper grinder. I like using sea salt. I am told that sea salt is lower in sodium and better for you. My Christmas gift from my son was a pair from Kuhn Rikon Ratchet Mills. You can easily adjust the size of the grind by turning a knob on the output. It is super easy to load, as it has a little door that swings out on the side and you simply pour the salt and peppercorns into the unit and close it. I love this pair – my family says it looks like it is a Dalek out of an episode of Dr Who! My salad spinner. I had one for a long time that served me well, but it recently broke and my husband replaced it with a Kitchen Aid spinner… it was okay, but the lid kept coming apart and was not the easiest to reassemble. I bought one from Oxo at my local market and I love this one. The bowl is nice and solid and pretty enough to put the salad in after for serving. It has a simple slide lock that keeps the pump in place for storage and a button for breaking. My pots and pans are of course my best friends. I was fortunate enough to be able to buy my all clad stainless pots at a kitchen store that was going out of business – it was 40% off and I was able to save several hundred on that, or I would not have them! They were the display models so they had a few scratches on them, but they work great. The thing about All Clad that I love is that they are heavy, thick bottomed pots and pans that conduct heat evenly. Even heat is always a good thing! For my non stick pans, I am falling more and more in love with my Lodge cast iron skillet. It is heavy behemoth of a monster, but now that I season it properly, it is the one pan I like to use. What I love is that it can go from stove top to oven with no problems, but it does get HOT! My lighter companion non-stick skillets are scanpan, which have a thin porcelain vs teflon coating. I found they do get scratched easily though, so I usually have a layer between them when I store them (like bubble wrap or paper) and I try not to over-heat them. We love pizza and calzones at our house. My must have for that is a pizza stone! I love my pizza stone from Pampered Chef, but you can find other brands as well that do a good job. Pampered Chef used to have one that was round that did not have handles.. I liked that model better because it was more versatile. It did have a metal rack you could slide under it that would give you handles for easy lifting. Crock pot liners: I only recently discovered them. I love the fact that the food no longer hopelessly gets stuck on the side of my crock pot and it is much easier to clean. I just discard the liner, give the inside of the crock-pot and lid a quick wash and get on with my day, rather than having to soak and scrub the food from the side wall of the insert. Of course I should not forget my work horses of the kitchen: good quality knives! The brand that I use is Wusthof Classic. I find having quality knives in the kitchen makes the prep time shorter. I like to keep my knives sharp – a dull knife can easily slip and hurt you more than a sharp one can, though I get occasional cuts, they are the gift I will give to a young couple as a gift. There are plenty of good brands available, but because I am used to the feel and balance of Wusthof I use them. They have a new line however, Gourmet that is cheaper (and also more cheaply made) that lacks the balance that Classic or Grand Prix have. These are some of my favorite things. I hope they help you in your kitchen as well. Categories: Uncategorized | Tags: kitchen tools | Permalink. At Christmas time, I always look forward to attending an annual Christmas Tea at a church. The food that stood out to me this year was their Curried Chicken Salad served in a pita pocket. I immediately begged my friends Cara and Elizabeth in the kitchen for the recipe and they were happy to share with me. Yay for everyone, because I got permission to share the recipe on my blog. Today I had the chicken salad on a bed of greens. I use a rotisserie chicken, but for large amounts, canned does a lovely job as well. I also made this salad for our choir Christmas Eve services, and several people asked for the recipe. This Curried Chicken Salad can be enjoyed year round! 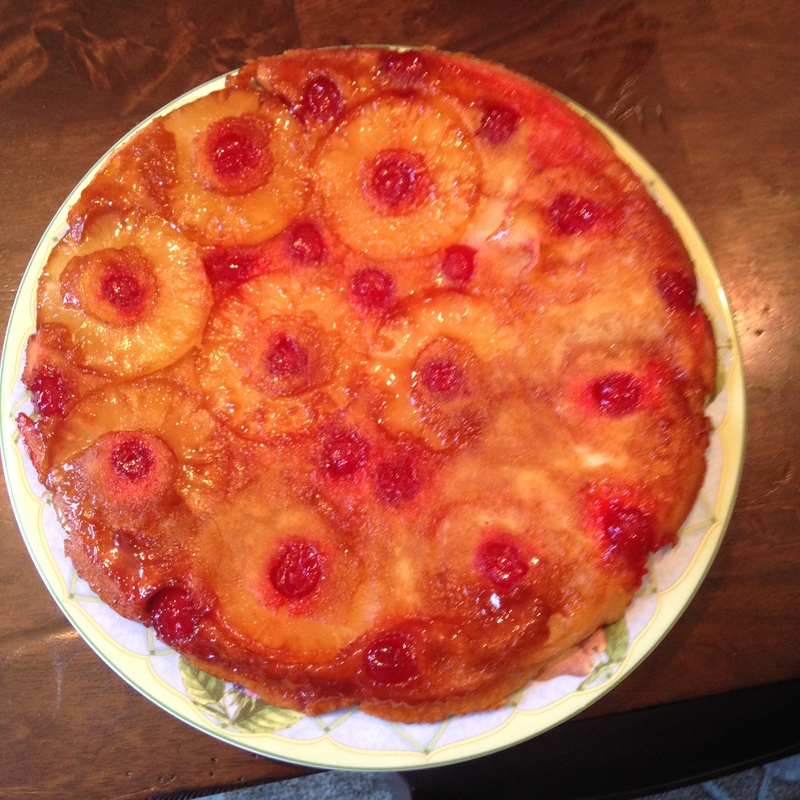 Thank you Cara and Elizabeth for sharing this yummy recipe! Combine the chicken, water chestnuts, pineapple tidbits, and grapes in a bowl and toss. Combine the dressing ingredients in a separate bowl and pour over the chicken mixture. Stir to combine. Refrigerate until serving. Sprinkle with slivered almonds just before servings. Serving Suggestions: Fill pita pockets with a generous scoop of chicken salad, or serve over a bed of greens. Pecans are also very nice instead of slivered almonds. 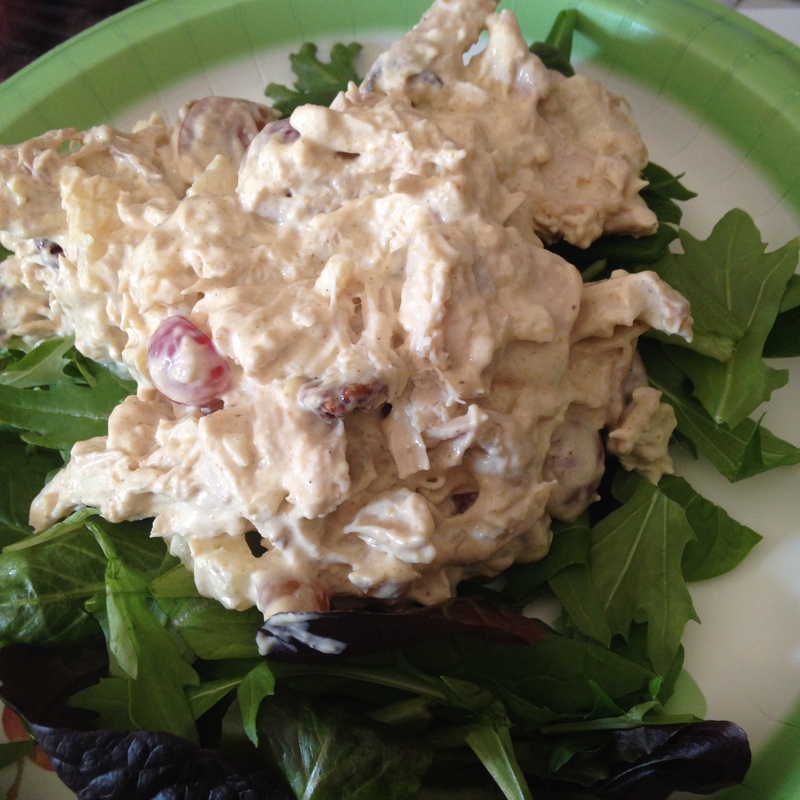 Categories: Uncategorized | Tags: Curried Chicken Salad, Salad | Permalink.